So, first up: Five things Andrew wanted to tell you, (and I quote): "God is real, God loves you. God loves the little children. I like strawberries. I tell good jokes!" I'm loving his random!! And priorities! #1: #memorylane anyone?! Dude the skip protection. And the beanie baby and the rewinding. Ahh. Crazy it was "only" 15 years ago huh?! The taping of the radio song reminds me- very first time I did that was with a BSB's radio interview/new album premier. Which brings me to ask, which was your jam- BSB or N*Sync? Believe it or not, I was way more into BSB and have almost all their songs memorized (still! haha). I actually found a CD of N*Sync's at the library, for like $1, but didn't end up getting it because I only had change on me and didn't want to pay with a zillion coins for it. Hmm maybe I missed a new love? Oh well! I finally got a piece done for the "safe" theme inspired by the huge thunder & lightning storm last night. I used lines from two of my favorite songs "Still" & "Safe in the Arms of Jesus." I am realizing more and more that I feel the most safe when I decide to just rest in Him. 3. It's official- the PSL is back!! (Pumpkin Spice Latte) and Starbucks is celebrating its tenth glorious year! We here are celebrating our hometown making it to a Starbucks commercial! (No joke!!) Like, seriously stoked here! Our area isn't huge by any means. But I love that we have a claim to fame and now and awesomesauce wall painted with the love! Check it out! 5. 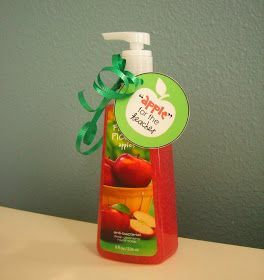 Back to school teacher gifts. What is your take on them?? Don't even get me started with what's on Pinterest. What is this? Teacher appreciation week//year?? I love our son's teacher. Don't get me wrong there! I just don't know how I feel about going all out so much. Shame on me anyways though as we're heading into the third week of school and I haven't even done anything yet. Oops. Maybe this easy peasy idea or something? Now, if you'll excuse me, I have a ton of Pinterest inspired ideas to print up for a garden chic rustic wedding I am doing later today. So nervous!! (I always am!) This time though? I'm bringing my pose ideas on location so I get every.single.one I want. What are you up to this weekend? Oh also? Adrian is one today. Just, no way. P.s. Check out my redesigned sidebar, complete with an "about me" page as well as links to recipes, posts about our family and more (link to my photography page, social media sites, etc). More redesign stuff and new blog name coming in the next few weeks (hopefully!!) What do you think?